I’m so happy to have finished on time for the ongoing RTW contest of pattern review. It’s my favorite contest and actually the only one I manage to enter. Last year I made this skirt, inspired by McQ. For this year I really fell in love with this Preen Line skirt. I think it’s cute and it will fit my new life perfectly (more on that later). 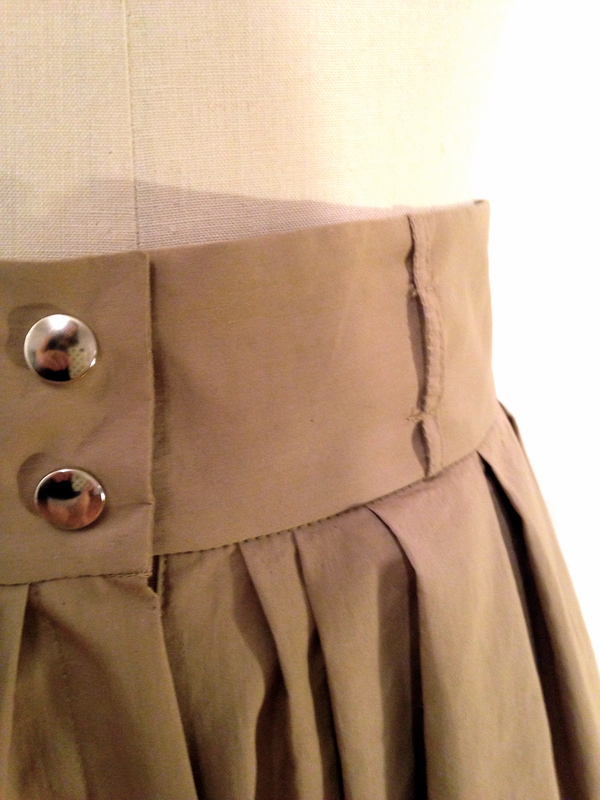 I really like this skirt and it was pretty easy to make too. First I draped the body and the belt on my form with muslin to arrange the pleats. Then I trued the lines and transfered the drape on paper. 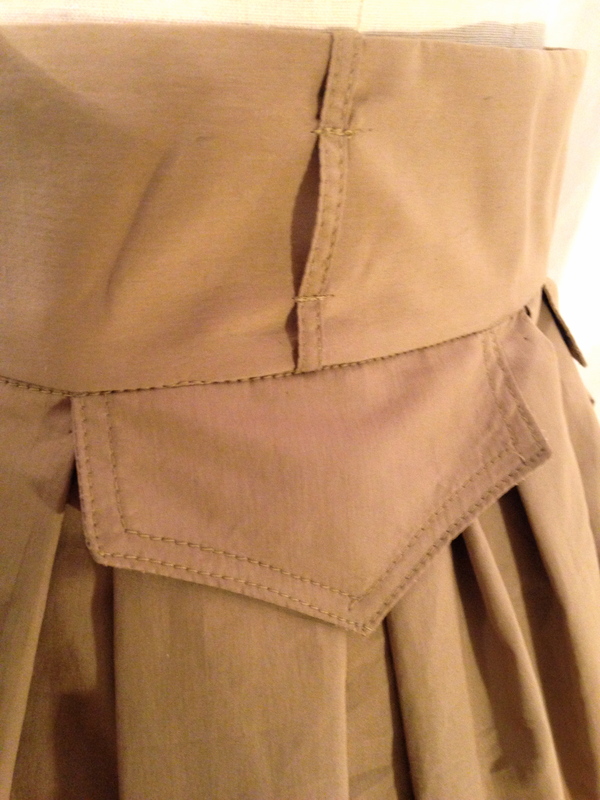 I drafted back faux-flap-pockets and I traced the zipper front from my Lagarfeld skirt and I added sewing and hem allowances. As you may see there is no side seam, I don’t think there is one on the original skirt either and it makes the construction SUPER fast. Now on the material side, the cotton is Poplin from Mood, here in NYC and it was from Theory. Zipper in from Pacific Trimmings and the snaps were in my stash. Yeeeeeaaaaars ago (yes many, ok maybe not so many, let say 10) I came across this snap/eyelet kit from Prym. At the time I was broke and in High School and the 30-40 euros felt like a big indulgence (time passes…). Well, I’m pleased to report that it was TOTALLY worth it. I’ve used it many times over the years, still have supplies in it and the tool+attachments is great and a lot better than using hammer or any other tool I tried. For the challenge on PR I tried to take pictures similar to the one on the Outnet, it was actually fun! Do not try this by yourself with your camera on a stand, you need someone to look at the original picture and correct you (thaaaaank yoooouuuu Boyfriend!!!!). Trust me, I wasted A LOT of time. If you’d like and you are a PR member, you can look at the amazing garments made by the other contestants and vote here! As of now, my favorite entry is Kristine’s, I loved following her process of making it! So finally (it’s a long one I know), I’ve been away from the blog the last few weeks but not from the sewing machine as I hope to show soon. Also it’s really cold in NY now and I don’t like to take pictures inside… Plus, most of the stuff I made is spring-summer. You may think that I’m transitioning early into spring but I found out last month that I MOVING TO HAITI, like next week. I’m going there for work and I’m super excited for the challenge and the opportunity to learn so much. Plus I secretely hope to meet La Karibane! How do I know? Thanks to the Great Idea (yes capital letters) from Another Sewing Scientist of a google map of sewingblogland! Anyway, I have a few more things to post before I live but there will be a little break while I’m setting up in Port-au-Prince and wait for my sewing machines (coming by sea). See you soon!! oh I love it, especially the pockets! And I like the added length. I don’t think I’m a prude but store-bought skirts can be so short! Thanks! It is true that longer skirts in the end are more versatile… Some of my “New York” skirts, I realize that I’m embarrassed to wear them whenever I’m in Paris!